Encouraged by some of our investors, we are introducing an All-Equity portfolio to our lineup of Separately Managed Account (SMA) programs at Fidelity. 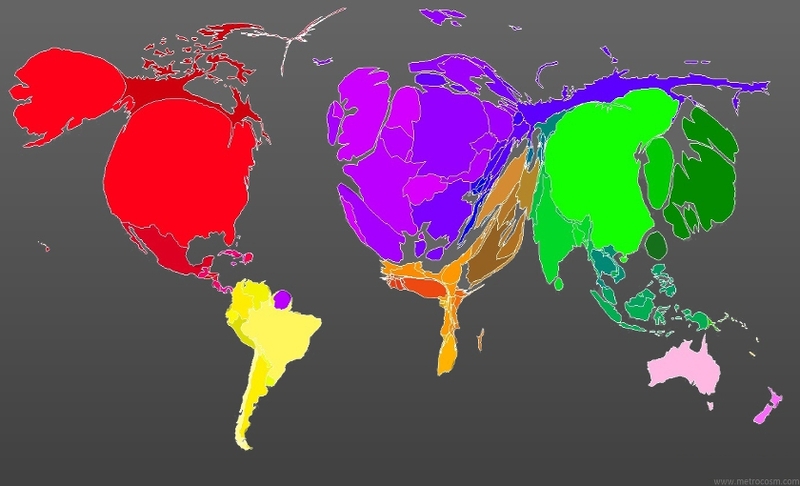 Elm’s All-Equity program will have a Baseline of 100% Global Equities, in contrast to our current Global Balanced programs which have a Baseline of 75% Global Equities and 25% US Fixed Income.2 Our All-Equity portfolios will be managed algorithmically with a dynamic asset allocation driven by value and momentum, in line with the Active Index Investing® approach we’ve applied since 2012 to our Global Balanced portfolios. We will use low cost ETFs and index funds to construct client portfolios, will charge our standard 0.12% per annum management fee and will maintain our usual focus on cost and tax efficiency.3 The portfolios will be long-only, unlevered, and invest only in broad-market ETFs and index funds. Our All-Equity portfolios will always have a target of being fully invested in global equities. This note describes details of the asset allocation methodology, implementation and historical return simulation. Please feel free to email info@elmfunds.com or set up a call with us if you’d like to learn more, or go to the Invest with Us tab on our website to set up an account. Our new All-Equity program is designed for investors who want Elm’s global diversification and value-and-momentum approach to equities, but who want a relatively constant amount of equity exposure or want to manage their cash and fixed-income assets on their own. In contrast, Elm’s Global Balanced Program is designed for investors who want Elm to dynamically manage their exposure to equities versus fixed-income, with a balanced 75%/25% Baseline Asset Allocation as the starting point. This may be suitable for investors who want Elm to manage a meaningful fraction of their liquid wealth, who want to be more hands-off with their asset allocation, and who want an investment program with a risk level that varies through time as a function of the attractiveness of available investments. Investors can also hold both a Global Balanced and an All-Equity account to achieve a Baseline risk level in between that of the two programs. This may be suitable for investors who want the dynamic risk level of a Balanced program, but who have a tolerance for a higher level of variability and expected return. With the normal caveats about past returns not being predictive of the future, simulated historical returns for the All-Equity program over the past roughly 40 years had about 50% more variability and 20% higher real returns than did the Global Balanced strategy, as described more fully in the Historical Simulation section below. Value and momentum signals often yield offsetting recommendations, which makes them more effective when used together than individually. We are attracted to broadly diversified, rules-based investing which index products tend to facilitate, and to the cost and tax efficiency of index products. One of our core principles is to focus on costs, and you can see our note here on why we think reducing costs is even more important than meets the eye to maximizing investor risk-adjusted returns. We start by constructing an All-Equity Baseline portfolio intended to be more representative of the Global Market Portfolio than the adjusted-market-capitalization indexes of MSCI and FTSE, with a moderate “home bias” preference for US investors. The process is the same as applied to constructing our Global Balanced Baseline, except in the All-Equity Baseline we put a 0% weight on fixed income assets. The table below shows the Baseline weights and the desired targets as of September 30, 2018. You can find more detail on our Baseline construction and value and momentum overlay here. We will manage All-Equity SMA portfolios using Elm’s proprietary Ulmus portfolio management system, which is designed to balance cost efficiency, tax efficiency and tracking error versus target weights on an account-by-account basis. As with the Global Balanced programs, we will rebalance portfolios on a 40-day cycle.10 We will also more frequently evaluate portfolios for tax-loss realization opportunities and use the Ulmus system to find and execute appropriate portfolio trades while taking account of wash-sale rules and transaction costs. 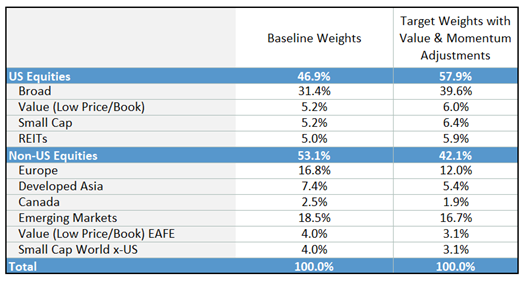 We expect portfolios to have weighted average expense ratios (excluding Elm’s 0.12% pa management fee) in the range of 0.08% to 0.12% per annum, and over time we expect ETF and index fund fees to decrease even further. 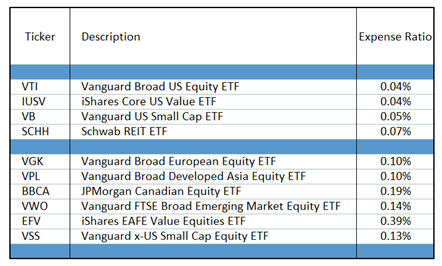 The table below shows a sample of the instruments we intend to use to build All-Equity portfolios, though many more instruments are in our database for consideration and possible use. Clients can add to or withdraw from their accounts at any time. We will normally invest additions of $50,000 or more on the business day following their credit to the account. We will invest lesser amounts at the next portfolio rebalance date. While our target cash balance is 0%, accounts will in practice generally hold a small money market balance, from interim dividends and also as a cushion to insure smooth trade settlement. We will try to keep this cushion below 0.25% on each portfolio rebalance date. Our SMA programs at Fidelity are available only to US investors,11 but if we receive sufficient interest from non-US investors we intend to structure an All-Equity Cayman fund for non-US investors too. As usual, we stress that historical data on its own is not sufficient to establish that an investment strategy such as the one outlined in this note is a good one. We are firm believers that past returns are not indicative of future performance. However, history can lead us to conclude that a strategy is poor, and it is with that perspective that we look to the past. The chart below shows a simulated back-test from December 31, 197412 to September 30, 2018. Our All-Equity program’s dynamic value and momentum overlay added 1.3% pa of extra return with no material increase in volatility, sampled monthly, versus the returns of a static weight All-Equity Baseline portfolio. 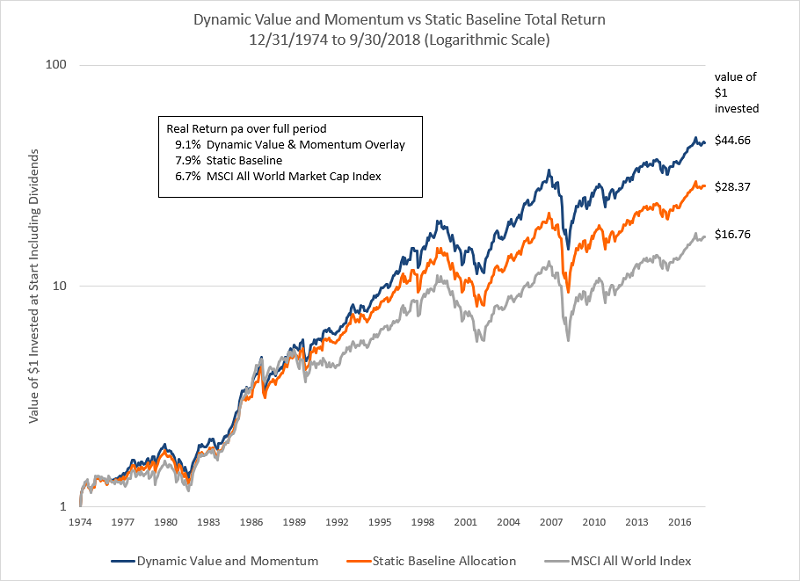 This is in line with what we would have expected given that the value and momentum overlay applied to the Global Balanced Baseline increased returns by 2.7% a year with no material increase in volatility over roughly the same historical period, as we reported in our 2016 Journal of Portfolio Management paper. This makes sense as the Global Balanced portfolio has more flexibility to vary its asset allocation compared to the All-Equity program. The variability of the difference in returns between the dynamic and static All-Equity portfolios was 1.9% pa, sampled monthly, suggesting a Sharpe Ratio for the dynamic versus static strategy of 0.7 over the full period. This is consistent with the finding that the value and momentum overlay resulted in outperformance 60% of the time to a monthly horizon. However, as we’d expect, to a longer-term horizon of five years the outperformance was more consistent, occurring in 97% of 466 rolling five-year periods evaluated at the end of each month. This is shown in the chart below. 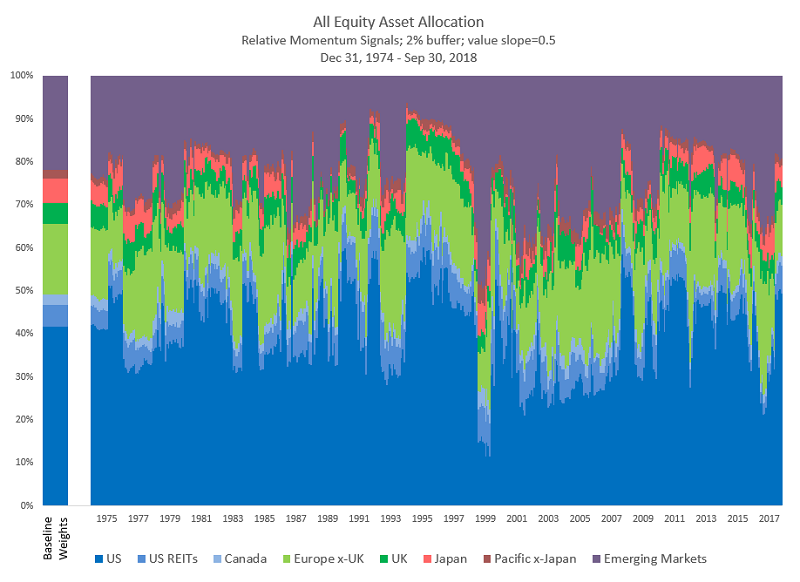 The final chart shows the simulated historical desired asset allocation of the dynamic value and momentum asset allocation. Portfolio turnover over the period averaged 60% per annum. In practice we expect lower turnover, as rebalancing would be every 40 days rather than monthly and we generally do not rebalance every bucket back to its exact desired weight. In order to simulate returns from 1975, we had to make a number of simplifications to the strategy owing to some data not being available over the entire history. Going forward, we would update the Baseline weights annually, but in this back-test we have kept them fixed at today’s Baseline weights. However, we do not think this has a material effect on the performance of the value and momentum dynamic overlay relative to the Baseline. Also due to limitations of the available data, the buckets we’ve used for the back-test are not a perfect match of the buckets we will divide the portfolio into going forward. For example, the back-test does not include some buckets that we intend to use in the program in the future, such as low Price/Book and small cap buckets, and on the other hand the back-test has a more granular split than we intend to use going forward, with Europe split into Europe x-UK and UK and Developed Asia split into Developed Asia x-Japan and Japan. Return figures include a 0.3% per annum reduction in the dynamic All-Equity strategy for transactions costs, fees and non-recoverable foreign withholding taxes, 0.2% for the static Baseline and 0.15% for the MSCI All Country World index to May 31, 2008, and afterwards we use the total return of the iShares ETF ACWI. We assumed rebalancing back to target each month-end rather than every 40 days. We used the same Cyclically-Adjusted Earnings Yield centering point of 6% for all regional equity markets. In most other details, we generally made choices that would make the back-test consistent with how we have implemented our Global Balanced strategies. We stress again that this historical data should not, by itself, be the basis for making an investment decision. The results suggest that an All-Equity program like we’ve conceived has been historically sensible. Still, the All-Equity program is primarily designed for investors who already like this style of investing on principle and would like Elm to provide a sophisticated and efficient implementation. Please be in touch with any questions or suggestions. You can request a short presentation describing our Global Balanced and All-Equity SMA programs here. If you’re an existing Elm investor and would like to open an All-Equity account, you can email us or give us a call, and if you’re a new investor to Elm you can start the process for opening an account here. Thank you to Doug Lucas, Bruce Lafranchi, Larry Hilibrand, Arjun Krishnamachar, Rich Dewey and Vlad Ragulin for their helpful comments. Asness, C.S., T. J. Moskowitz, and L. Pedersen. “Value and Momentum Everywhere,” Journal of Finance, Vol. 68, No. 3 (2013), pp. 929-986. Campbell, J., and R. Shiller. “The Dividend-Price ratio and Expectations of Future Dividends and Discount Factors.” Review of Financial Studies, 1 (1988), pp. 195-228. Cochrane, J. “The Dog That Did Not Bark: A Defense of Return Predictability.” Review of Financial Studies, Vol. 21, No. 4 (2008), pp. 1533-1575. De Grauwe, P., and M. Grimaldi. “Bubbling and Crashing Exchange Rates.” Working Paper, CESifo (Series No. 1045), 2003. Dewey, R., and Haghani, V. “A Case Study for Using Value and Momentum at the Asset Class Level.” Journal of Portfolio Management, volume 42 number 3, (Spring 2016). Fama, E.F., and K.R. French. “Business Conditions and Expected Returns on Stocks and Bonds,” Journal of Financial Economics, 33 (1989), pp. 25-49. Fama, E.F., and K.R. French. “Dissecting Anomalies.” Journal of Finance, 63 (2008), p. 1653-1678. Ferson, W. E., and C. Harvey. “The Variation of Economic Risk Premiums.” Journal of Political Economy, Vol. 99, No. 2 (1991), pp. 385-415. Gnedenko, B., and I. Yelnik. 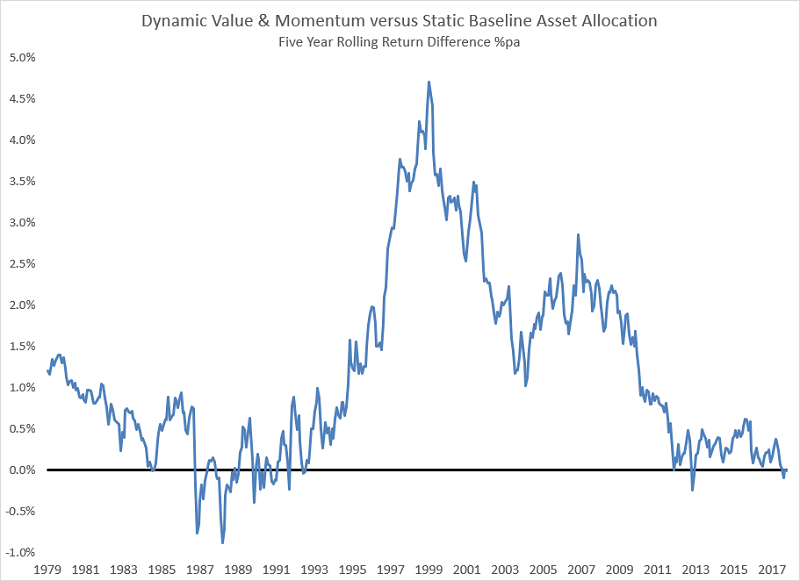 “Dynamic Risk Allocation with Carry, Value and Momentum.” Working paper, ADG Capital Management LLP, 2014. Jegadeesh, N., and S. Titman. “Returns to Buying Winners and Selling Losers: Implications for Stock Market Efficiency.” Journal of Finance, Vol. 48, No. 1 (1993), pp. 65-91. Kahneman, D., and A. Tversky. “Judgment Under Uncertainty: Heuristics and Biases.” Science, Vol. 185, No. 4157 (1974), pp. 1124-1131. Moskowitz, T.J., Y.H. Ooi, and L.H. Pedersen. “Time Series Momentum.” Journal of Financial Economics, Vol. 104, No. 2 (2012), pp. 228-250. Pirrong, C. “Momentum in Futures Markets.” Working paper, University of Houston, 2005. Soros, G. The Alchemy of Finance. New York, NY: Simon and Schuster, 1988. Wang, P., and L. Kochard. “Using a Z-score Approach to Combine Value and Momentum in Tactical Asset Allocation.” Working paper, Georgetown University Investment Office, 2011. NOTE: This is not an offering document. Past returns not indicative of future returns. The value of an investment and the income from it can fall as well as rise and you may not get back the amount originally invested. In our Global Balanced programs, we include other risk assets such as high yield bonds and REITs when we refer to equities. Global Balanced programs come in three flavors: Taxable, Non-Taxable, and US/UK for US citizens living in the UK. The All-Equity portfolio will also be available for non-taxable accounts, in which case tax-efficiency considerations will be relaxed. See our recent letter here where we discuss the Baseline Asset Allocation construction in greater detail. See our notes here and here for a deeper discussion of this body of work. A working paper version of Value and Momentum Everywhere, Asness, Moskowitz and Pedersen, was in circulation from 2009 SSRN here, and presented at the 2010 AFA meeting, although the paper only appeared in the Journal of Finance in 2013.. You can find a copy of our paper here. To normalize the target weights to 100% and impose the 2x constraint we iteratively impose the constraint and re-normalize until both the normalizing condition and the constraint are fully satisfied. This is also consistent with the treatment of momentum signals in this early paper on implementing value and momentum in an asset allocation context: Blitz and Van Vliet, “Global Tactical Cross-Asset Allocation: Applying Value and Momentum Across Asset Classes,” Journal of Portfolio Management (2008). We set the slope of the value signal in the All-Equity program to 0.5, in contrast to 1 in our Global Balanced programs. Our choice of 40 days for the rebalancing frequency was influenced by a desire to make it easier to avoid potential wash-sales, and also to not set rebalancing dates on the same day each month. Specifically, investors with a US Social Security Number. Many of the historical data series we need for this analysis begin December 31, 1974, particularly the MSCI data series for regional equity market total returns and earnings.